Welcome ladies and gentlemen to the seventh season of Motorz! It’s hard to believe how quickly the past six season have gone but with this latest entry, it’s clear we’re just getting started! From extensive upgrades to our project Jeep Wrangler’s interior to a seriously high-performance driving school, this is an action packed episode. 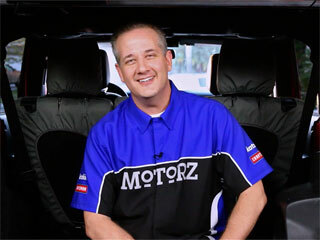 Sit back, buckle up and get ready for Season 7, Episode 1: Jeep Wrangler Interior here on Motorz! One of our most beloved vehicles is the Jeep Wrangler. The unmistakable look, incredible off-road capabilities and ease of maintenance make it a dream in countless situations. Plus, with it’s lego-set type of assembly, it’s easy to upgrade even with limited auto know-how. Ready to transform your Wrangler’s interior? In this episode, Chris has you more than covered. First up, we’ll show you how to install Hothead Headliners. Simply by removing the top and adding these factory quality additions, your Wrangler will stay cooler in summer, hotter in winter and decrease wind and road noise. From there, Chris moves on to tech upgrades, including an sPod toggle panel, Kicker sound and sub processor and Katzkin Degreez seat heaters/coolers. While these additions do require some advanced installation, Chris walks you through step-by-step, giving you all the info you need for a straightforward, successful install. Wrapping up our interior additions (for now), you’ll see how to drop in BedTred floor liner, H3R Performance Fire Extinguishers, and learn why Covercraft SeatSavers are a must have. Incredibly, that’s only the first half of the episode. Next up, Alan’s son, Christian, heads to BMW’s Performance Driving School. From defensive driving to wet weather and on-edge handling maneuvers, top-flight BMW instructors turn students from fairly inexperienced rookies into skilled, confident and prepared drivers. It’s a segment not to miss, including some lessons to apply to your everyday commute. As always, in our Partz segment, Chris will go over some of the latest and greatest tools to add to your collection. In this episode, get the details on Craftsman’s Portable Air Mover and the Superwinch Kangaroo Kinetic Recovery Rope. Want to stay up-to-date on the latest in the automotive world? Follow us on Facebook and Twitter!